It has been five years since Sufjan Stevens released The Age of Adz (2010), so it is no surprise that there is some hype for his latest full length, Carrie & Lowell, which is due out next week via Asthmatic Kitty. The album is a return to Stevens’ earlier sounding work, which was more intimate with highlights on his hush vocals and softer strumming. 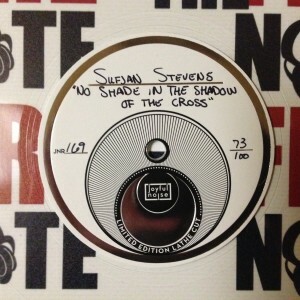 Stevens said the album’s 11 songs are about “life and death, love and loss, and the artist’s struggle to make sense of the beauty and ugliness of love.” Well, “No Shade in the Shadow of the Cross” is our first physical taste of the album and it is great first foot forward. The A-side track spotlights Sufjan’ s best talents as his voice sounds like he is whispering this song in your ear. He stated before that Carrie & Lowell is his life and that statement plays out on this song as you can hear his apartment air conditioner providing some support to his acoustic guitar. It gives the song an extra edge, which most certainly will hit a nerve. There is no B-side track on this release. To initially get ahold of this one you needed to be a VIP over at Joyful Noise Recordings. 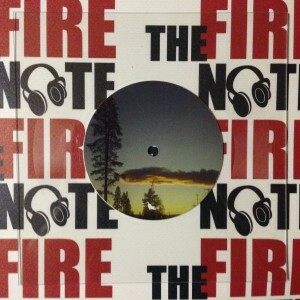 The lathe-cut record is the only physical release of the single and it is limited to 100 hand-made, hand-numbered copies. The square piece of plastic comes in a protective sleeve and features no other artwork except what you see on the front and back of the lathe-cut. These sold out very quickly so if you would like to add this rare Sufjan Stevens item to your collection start searching around the second hand market.